Today marks the last day of our 28-Day Home Organization Challenge. Over the last 4 weeks, we’ve taken on so many different challenges, de-cluttering, establishing daily, weekly and monthly routines. We also learned some tips about how to not get overwhelmed by it all, how to get the kids involved and how to make it fun. We’re going to round it all off today with another challenge that will help you save time and money. Although we’re at the end of the 28-Day Challenge, it doesn’t mean that we stop now. I’ll be continuing to guide you, every Sunday, with some tips and tricks as well as an overview of what we should be doing for the week. Don’t forget, we’ve created a Reminder Binder to help as well. Keep up the good work and let me know how it’s going. I’m always looking for ways to make tasks that I hate to do a little easier and more fun. Creating a weekly menu is not a fun task for me. Every week it seemed like I would spend way to much time trying to create a menu that didn’t repeat what we had the previous week. Then I’d spend even more time going through each of the recipes to create a shopping list that included everything that I needed. Finally, I would meander through the isles of the supermarket looking for everything that was on my list. I was spending a lot of time just getting the food in the house. There had to be an easier way! I’ve dedicated a whole section in our Reminder Binder for menus because I was able to work out a way to make menu planning a whole lot easier. It’s going to take a little time at the beginning to get started, but once you’re done you’ll be amazed at how much time and money you’ll save. Begin by making a list of meals that your family enjoys, including the side dishes. Do this for breakfast, lunch and dinner. Then categorize each one of the meals: chicken, beef, quick & easy, etc. Here are a couple of printables to make it easier. 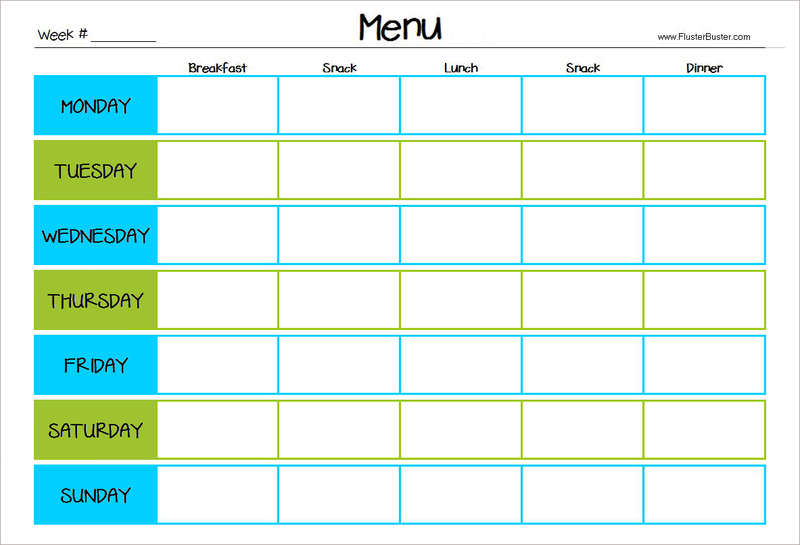 Using the list of meals that you created, begin placing them on your weekly menu. I like to choose a meal from each of the categories to add a little variety to our menu. Once you’ve completed the menu, place it in a sheet protector and place it in your Reminder Binder behind the menu tab. Now go through each of the meals on your menu and make a list of the items that you’ll need to create that meal. Place the items in the appropriate category on your shopping list. Be sure to include items that you buy on a weekly basis that aren’t included in any of your menu items such as beverages. When you’re done, place the shopping list in a sheet protector and file it in your Reminder Binder behind the menu tab. When you’re ready to go shopping, just grab the shopping list from your Reminder Binder, sheet protector and all, along with a dry erase pen. Use your dry erase pen to mark off items as you put them in your cart. Repeat steps 1-3 until you’ve created several weeks of menus and shopping lists. I have 8 menus and shopping lists in my Reminder Binder and not one of the meals is duplicated on any of my menus, except for breakfasts and lunches. You won’t have to rack your brain trying to create a new menu every week. You won’t be serving the same thing over and over, unless you want to. You’ll save time because your shopping list is already made. You’ll spend less time shopping, because the items are laid out by sections in the supermarket. 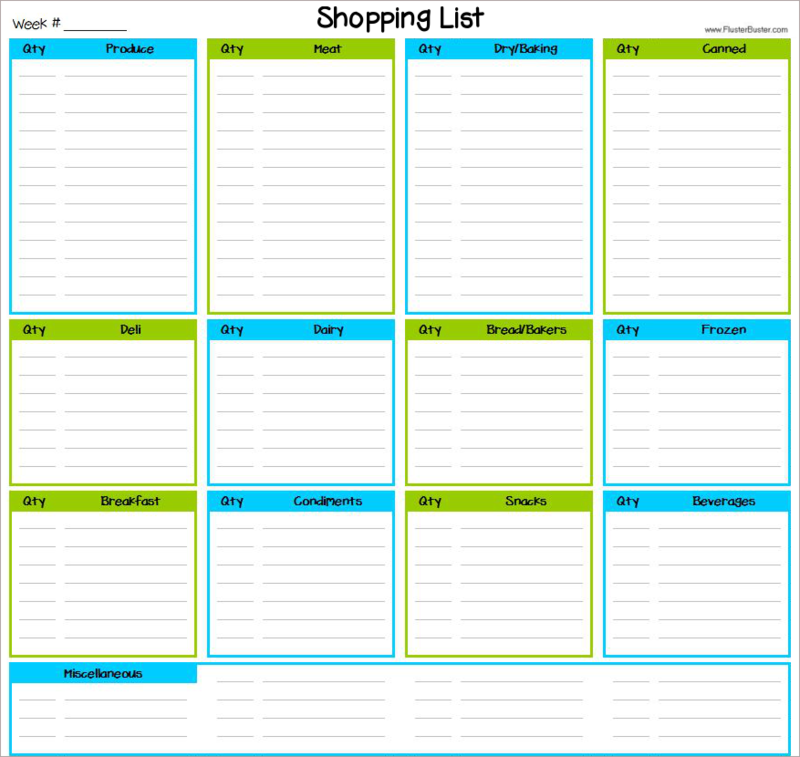 You’ll save money because you’re shopping from a list. Create several menus/shopping lists, so that you can rotate them. If you like to try new recipes, dedicate a day or two every week for them. Just make a separate shopping list for the items you’ll need. If you like to go out to eat, block out a day on your menu. Print a copy of all of the recipes you’ll need for the week and keep them in your reminder binder.